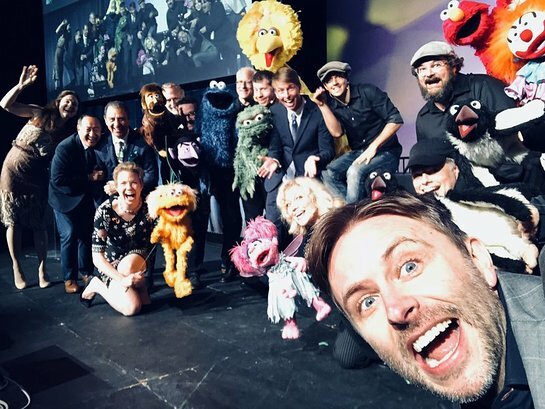 On Saturday, May 5th, celebrities and puppet VIPs showed their support for puppetry when The Jim Henson Company hosted the second “Puppets for Puppetry” on its historic Hollywood lot. 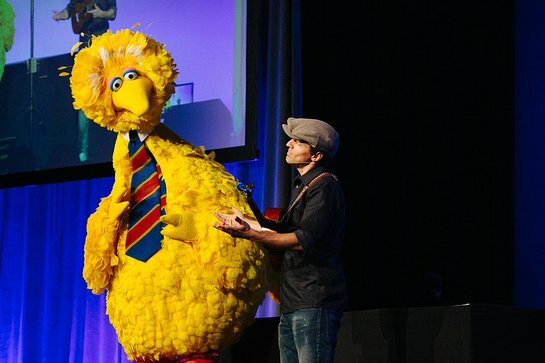 The event raised funds for the Atlanta-based Center for Puppetry Arts, and honored the esteemed puppeteer Caroll Spinney, best known to fans around the world as the performer of the iconic Sesame Street characters Big Bird and Oscar the Grouch. 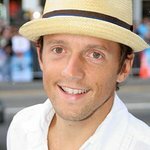 The unique live performance was hosted by comedian Chris Hardwick (The Wall, Talking Dead) and featured special guests Jack McBrayer (30 Rock, Wreck It Ralph), Bobby Moynihan (SNL, Inside Out), and Grammy Award-winner Jason Mraz (“I’m Yours”). The unforgettable evening raised well over $225,000 for the Center and included tribute music and sketches from Sesame Street cast members Matt Vogel, Eric Jacobson, David Rudman, Leslie Carrara-Rudolph, Ryan Dillon, and Jennifer Barnhart. Brian Henson, Heather Henson, Bill Barretta, and other special guests also gave puppet performances. The Center for Puppetry Arts’ mission is to inspire imagination, education and community through the global art of puppetry. The Atlanta-based nonprofit is the nation’s largest and only resource of its kind, featuring a worldwide puppetry collection, a vibrant theatre space and the development of puppetry talent through workshops and performances. Also, the Center for Puppetry Arts uses the latest technology to offer its award-winning Distance Learning programs for PreK-adult through videoconferencing. The arts-infused workshops and interactive puppet performances are conducted via videoconferencing and are tailored to specific classroom topics and curriculum. The programs complement national curriculum standards in language arts, social studies, science, math and other areas and serve schools nationwide. The Center’s two permanent exhibits, the Jim Henson Collection and the Worlds of Puppetry Global Collection, together represent the most definitive display of both Henson puppets and other puppetry traditions from around the world.